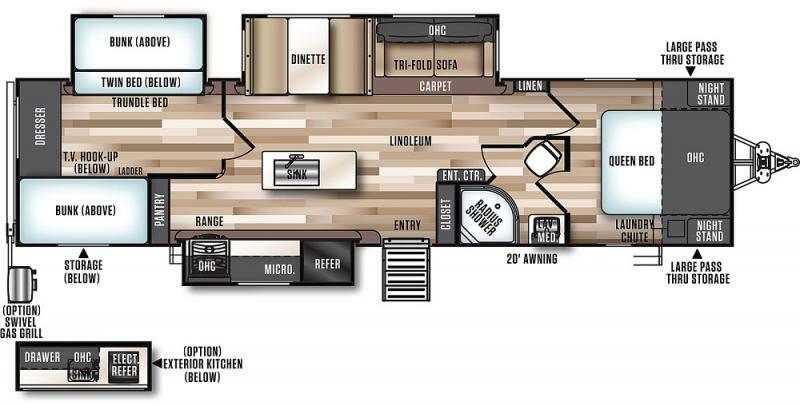 New to Young's RV Center Sales Lot is the 2019 Salem Hemisphere 300BH Travel Trailer. This triple slide bunkhouse Trailer by Forest River features a gorgeous front master bedroom with a queen bed, overhead storage, full mirrored wardrobe on one side of bed and a mirrored half-wardrobe with nightstand below on the other side. This private bedroom has an entry from the hallway or from the enclosed bathroom, which includes a neo-angle shower, sink with medicine cabinet, and toilet. Next you will enter the spacious living area boasting an elegance that will make you feel like you are vacationing in luxury. The super slide-out housing the booth dinette and tri-fold sleeper sofa allows more space for entertaining or simply relaxing in front of the entertainment center. Moving into the residential style kitchen, you will fall in love with all of the cabinetry and the island with stainless steel, single bowl, undermount kitchen sink. The 3-burner range/microwave/refrigerator slide-out makes cooking on the road a simply affair. The pantry can be stocked with necessities and stuffed with "goodies", eliminating multiple trips to the grocery store. And finally, at the rear of this Salem 300BH is the private bunkroom for the "little ones". Complete with a bunk bed/jiffy sofa slide-out and opposing bunks, wardrobe, dresser, and TV hook-up, this room will surely be approved by the kids. It has plenty of room for fun and games. With the convenience of an outside kitchen, 3 slides, and numerous sleeping options, this Salem Hemisphere 300BH is Perfect for the ENTIRE FAMILY! So hurry in to Young's RV Center and LET US show YOU how remarkable this Salem Travel Trailer is! Not only will you SAVE THOUSANDS, but you will be one step closer to planning your Dream GET-A-WAY. Call or Visit Young's RV Today! 800-447-2385. We have financing available for qualified buyers, extended warranty options available, and we also take trade-ins.